In honor of Anne Frank, congressional leaders will plant a sapling from the chestnut tree which grew outside the young girl's Amsterdam Annex window on the West Front Lawn of the U.S. Capitol. In conjunction with the event, a traveling exhibition, "Anne Frank: A History for Today," will be on display in the Russell Rotunda in the Russell Senate Office Building from April 30 through May 9, 2014. “From my favorite spot on the floor I look up at the blue sky and the bare chestnut tree, on whose branches little raindrops shine, appearing like silver…I firmly believe that nature brings solace in all troubles." Anne Frank, "The Diary of a Young Girl"
Congressional leaders will speak at the public ceremony for the dedication of the Anne Frank Memorial Tree on the West Front Lawn of the United States Capitol on April 30, 2014 at 3 p.m. Yvonne Simons, Executive Director of The Anne Frank Center USA, will give remarks at the dedication ceremony. The ceremony is organized by House Speaker John Boehner (R-­‐OH), Senate Majority Leader Harry Reid (D-­‐NV), Senate Republican Leader Mitch McConnell (R-­‐KY), and House Democratic Leader Nancy Pelosi (D-­‐CA). Anne Frank took great solace from the horse chestnut tree that grew outside the Amsterdam Annex in which she and her family lived during World War II. Anne described the tree lovingly in her famous diary. The Anne Frank Memorial Tree sapling was grown from the original tree, which was felled by a wind storm in 2010. Through the Anne Frank House in Amsterdam, chestnuts from Anne’s tree were taken for germination and grown into saplings to be donated to organizations and schools committed to carrying on her legacy. The Anne Frank Center USA received 11 saplings to donate to organizations in the United States. Anne Frank Memorial Tree saplings were cleared for planting in 2013. The first sapling was planted last year at the Children’s Museum of Indianapolis. Saplings have also been planted at Sonoma State University in California, Boston Common in Massachusetts, the Holocaust Memorial Center in Michigan, and the Southern Cayuga School District in New York. The remaining sites include Liberty Park, commemorating 9/11 at the World Trade Center Site in NYC; Central High School and the Clinton Presidential Center in Little Rock, AR; and the Washington State Holocaust Education Center. The Anne Frank Center’s traveling exhibition "Anne Frank: A History for Today" will be on display at the Russell Rotunda in the Russell Senate Office Building, in conjunction with the dedication ceremony. The exhibition tells Anne’s story of growing up a German-­‐Jewish teenager who was forced to go into hiding during the Holocaust. Since it was first published in 1947, Anne Frank’s diary has become one of the most widely-­‐read memoirs of the Holocaust. Its message of courage and hope in the face of adversity has reached millions. The diary has been translated into more than 70 languages with over 30 million copies sold. Anne Frank: A History for Today can be viewed at the Russell Rotunda at the U.S. Capitol from April 30 through May 9, 2014, Monday – Friday only. Parallel to the sapling plantings, The Anne Frank Center’s Confronting Intolerance Today speaker series continues to showcase innovative approaches to combating intolerance here in the United States and in the Netherlands, the home of Anne’s beloved chestnut tree. The next Confronting Intolerance Today event will take place on May 14 at the Dutch Consulate in San Francisco. 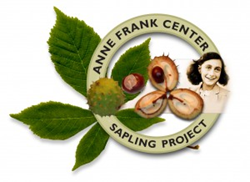 More information on the Sapling Project can be found at http://www.annefranktreeusa.com. The Anne Frank Center USA Sapling Project is made possible in part, by public funds from the Ministry of Foreign Affairs of the Kingdom of the Netherlands, The Netherland-­‐America Foundation and The Children’s Museum of Indianapolis and KLM Royal Dutch airlines, the official airline of The Anne Frank Center USA. The Anne Frank Center USA, a partner organization of the Anne Frank House, uses the diary and spirit of Anne Frank as unique tools to advance her legacy, to educate young people and communities about the consequences of intolerance, racism and discrimination, and to inspire the next generation to build a world based on mutual respect.